A High Place, (Hebrew bamot or bamah) was a raised altar or hilltop shrine in ancient Israelite and Canaanite times described as existing from the patriarchs period through at least the sixth century B.C.E. and beyond. High places consisted of a stone or earthen altar, often accompanied by a stone or wooden pillar symbolizing the presence of a deity, and sometimes a sacred tree. High places near major settlements sometimes evolved into formal temples. According to the Hebrew Bible, the ancient Israelite patriarchs and early prophets established altars and sacred pillars at high places, such as Bethel, Shechem, and Gilgal. Both prophets and Levite priests attended altars at these and other high places until at least the period of the ministry of the Elijah and Elisha. A movement against the use of high places developed as the Temple of Jerusalem emerged as a central sanctuary and the exclusive place of sacrifice to the Hebrew God. Some Israelite high places apparently combined the worship of the Hebrew God with Canaanite fertility rites, leading to increasingly harsh condemnations by prophetic and priestly writers. Scriptures such as the Book of Deuteronomy thus banned high places and the later prophets associated these local altars with idolatry, sexual immorality, and even human sacrifice. In the late sixth century B.C.E., King Josiah of Judah initiated a religious reform that destroyed some of the high places and attempted to bring local Levite priests who served at these sites to Jerusalem. The Books of Kings characterizes rulers as righteous or evil, depending on their attitude first toward idolatry in general, and second toward the high places in particular. Eventually, the Jerusalem Temple, itself a highly institutionalized high place, would be the only authorized place of sacrifice in the Jewish tradition. Archaeologists have found numerous raised areas in or near towns that were undoubtedly high places, some with religious artifacts such as altars, inscriptions, and images of deities. Although Israelite and Canaanite high places are now history, in the contemporary world, high places—both institutional and personal—are sought out by many people seeking spiritual insight and direct communication with God. Many have reported deep insights and profound life-changing experiences in such environs. From mankind's earliest times, mountains and hilltops were sacred places where humans stood suspended between the heavens and the earth. The earliest biblical descriptions of the sites later called "high places" are found in the Book of Genesis. Abraham first built an altar under the "great tree of Moreh" at Shechem and then moved on to Bethel, where he constructed a hilltop altar (Gen 12:6-8). Here, Jacob would later have his famous dream of "Jacob's ladder" (Gen. 28:18). Jacob himself also reportedly established both an altar and a sacred pillar at Bethel, which would eventually become a national shrine when the northern Kingdom of Israel seceded from the united kingdom established by David and Solomon. Abraham established another altar under "the great trees of Mamre at Hebron." (Gen 13:18) Later, he would climb a mountain in the region of Moriah, where he built an altar upon which to sacrifice his son Isaac as a burnt offering to Yahweh. Traditionally, this is understood to be the same high place where the Temple of Jerusalem was eventually built (2 Chronicles 3:1). Prior to the coming of the patriarchs, high places may already have been used by the Canaanites, who, like the Hebrews, viewed mountaintops as having spiritual significance because of their presumed physical proximity to the home of the gods. High places would continue to play a major role in Israelite worship for centuries. Moses met God at the top of Mount Sinai (also called Horeb), and the prophet Elijah, several hundred years later, journeyed to the same mountain for his own encounter with the Almighty. At Gilgal, Joshua set up 12 stone pillars when the Israelites crossed the Jordan River into Canaan. It was here that Joshua re-confirmed the covenant of circumcision for Israelite men, and the site would later become one of the high places visited regularly by the prophet Samuel (1 Samuel 7:16), as well as a place of idolatrous Canaanite worship (Judges 3:19). Bands of Israelite prophets attended various high places from the time of Samuel through period of the prophets Elijah and Elisha. 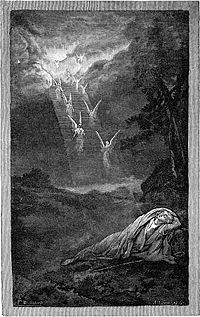 Elijah even battled the prophets of Baal for control of the high place at Mount Carmel and to demonstrate Yahweh's superior power as a rain god. High places were equally important in Canaanite and neighboring religions. When the prophet Balaam was hired by the Moabite king Balak to curse the Israelites who threatened his territory, Balak took Balaam to a succession of high places, where the prophet famously blessed Balak's enemies instead of cursing them. King Solomon later established idolatrous high places for his Moabite and Ammonite wives outside of Jerusalem, earning him, according to the author of the Books of Kings, Yahweh's rejection. 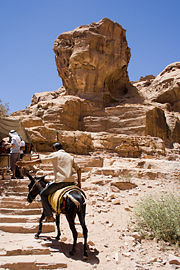 The Moabite king Mesha boasted in the Moabite stone monument of seizing an Israelite shrine at Nebo (the legendary mountain where Moses died) and dedicating it to his own god, Chemosh/Kemosh. And Kemosh said to me, "Go, take Nebo from Israel." And I went in the night and fought against it from the daybreak until midday, and I took it and I killed the whole population: seven thousand male subjects and aliens, and female subjects, aliens, and servant girls… And from there I took the vessels of Yahweh, and I presented them before the face of Kemosh. Petra may once have been the site of an Edomite high place. The Levite priesthood gradually replaced the prophetic bands as officiators at the high places scattered throughout Israel and Judah. These local priests competed with the central sanctuary at Jerusalem for the benefits associated with their sacrificial office. The Book of Deuteronomy, however, stipulates that God would name only one place where sacrifice was authorized, implying that this would be the Temple of Jerusalem itself. Under King Josiah (late seventh century B.C.E. ), Levites were encouraged, perhaps forced, to move to Jerusalem, where they would be accepted into a second-tier priesthood under the priests descended from Aaron. Josiah destroyed many of the high places and slaughtered those priests who sacrificed to gods other than Yahweh (2 Kings 22-23). 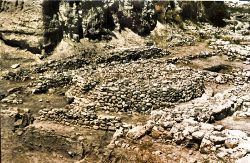 The Book of Kings mentions that Josiah even dared to destroy the ancient altar and high place at Bethel, just a few miles north of Jerusalem, to which northern pilgrims were likely to go. 800 steps lead up to the monastery at Petra. Although other high places survived, Jerusalem would henceforth be the only high place of the Jewish tradition. The high place at Mount Gerizim, near Shechem, would emerge as the central shrine of the northern worshipers of Yahweh, who became known as Samaritans. Gerizim was the site of a major temple for several centuries and is still a sacred place among the small Samaritan community in Israel and Palestine today. Meanwhile, Moabite, Ammonite, and Edomite high places continued as places of worship well into the Christian era. 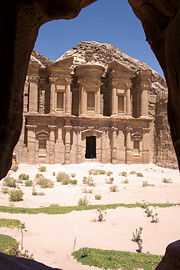 A probable former Edomite high place at Petra in modern Jordan later became the site of a Christian monastery carved into stone atop a mountain. Petra has been named as a UNESCO World Heritage Site. From the Old Testament and from archaeological remains, a good idea may be formed of the appearance of high places. They were typically on a hill above a town (1 Samuel 9:12-14). There was often a sacred pillar (matzevah), or a wooden pole (asherim), which marked the place as sacred and might itself be an object of worship. Of particular importance was the altar, either of stone or earthen bricks, on which offerings were burnt. A cistern for water might also be in evidence, as well as low stone tables for dressing the victims. Large sites included a hall for the sacrificial feasts. The religion of the ancient Israelites and Canaanites centered on these places. At festival seasons or to fulfill a vow, a person or family might journey to more famous sanctuaries, but ordinary offerings which linked everyday life to religion were made at the local high place. The building of royal temples in Jerusalem or Samaria initially made no change in this respect; they simply took their place beside the older sanctuaries, such as Bethel, Shiloh, Dan, Gilgal, Beersheba, etc. You lay down as a prostitute. The fundamental law expressed in Deuteronomy 12:1-32 prohibits sacrifice at every place except the Temple of Jerusalem. It was in accordance with this law that Josiah, around 620 B.C.E., destroyed and desecrated the high places throughout his kingdom (2 Kings 22-23), where Yahweh had been worshiped from time immemorial. While the earlier prophets up to Elijah had themselves sacrificed at high places even after the establishment of the Temple of Jerusalem, for the later prophets, the word bamot (high place) connotes a place of idolatrous worship. Even the most pious kings of Judah are censured for tolerating their existence. Following the death of Josiah (c. 608 B.C.E.) the old altars of Yahweh were restored; they survived the destruction of the Temple in 586, and it is probable that after its restoration (520-516) they only slowly disappeared. In fact, the Deuteronomic dogma that sacrifice can be offered to Yahweh only at Jerusalem was never fully established either in fact or in Jewish legal tradition. The Jewish military colonists in Elephantine in the fifth century B.C.E. had their altar of Yahweh beside the highway, and the Jews in Egypt in the Ptolemaic period had, besides many local sanctuaries, one greater temple at Leontopolis, with an official sacrificial priesthood, the legitimacy of whose worship is admitted even by the Palestinian rabbis of the early Talmudic period. In the Eastern Orthodox Church the High Place is also the name for the location of the episcopal throne, set in the center of the back of the apse of a temple's sanctuary. In larger temples there may be a literal elevation. It is surrounded on both sides by the synthronos, a set of other seats or benches for the use of the priests. Every Orthodox temple has such a High Place even if it is not a cathedral. The tradition of establishing crosses on mountaintops may also be seen as hearkening back to the ancient tradition of the high place. All links retrieved February 8, 2019. The High Place of Sacrifice. www.raingod.com. This page was last modified on 8 February 2019, at 20:49.